Oh Squirrel, run by Katie Wagstaff, will be selling at our Etsy Made Local Christmas Market 2017 at the Tooting Tram Shed and Social in South London on 2nd December 2017. We were curious about the beautiful things Oh Squirrel makes, so we asked Katie to explain a bit more! I’m Katie, a Yorkshire lass, now routed in North London, with a big love for 1970s florals, cheese plants, springer spaniels and Jarvis Cocker. I started Oh Squirrel as a bit of a hobby on the side of my job in fashion, about 5 years ago. I wanted to create a stationery and gift brand that had a nod to vintage, but has positivity at the heart of it and was accessible to all budgets. As more interest grew in the brand, I made the big decision to leave my career in Buying and set up Oh Squirrel as a full time venture. At first I straddled part time jobs to pay the bills whilst I was establishing the brand, but it’s been my full time job for a few years now, for which I’m very appreciative. Products vary from social stationery (greetings cards, postcards etc.) to gifts for all occasions, with a big specialisation in Hen Parties, as I saw a huge gap in the market for tasteful Hen Party accessories. We won’t be bringing any of these to the Christmas market as they’re quite seasonal, but you can view the range in the Etsy shop and our main website. Our product offering has grown significantly in the last few years, I’m forever thinking up new ideas for products or methods to make them. On a daily basis I have to pinch myself to believe this is what I do! These started as a bit of fun in the studio, and have become one of our best sellers. They’re perfect for pretty much anyone, and make a perfect secret santa or stocking filler idea. All the names that are personalised with names come from that idea of going to the seaside as a kid and picking out something with your name on. For me, it was a black velvet headband with ‘Katie’ in those 3D fabric paints. The headband met it’s fate when I clumsily walked into a lamppost! Anyway, a gift with your name on always feels extra special, and the fact they’re personalised to order means if you have an unusual name, or even a funny nick name, I can happily accommodate! No more feeling left out. There are a few different colour pouches to choose from, as well as various glitter shades and also velvet flocking. They’re printed on a heat press, and to make them extra special, a handmade pom pom is added to the zip pull. I think they’re really good fun and a great gift. We won’t be offering the personalised ones at the Christmas Market, but they can be ordered online. We’ll have a range of other fun pouches available though! 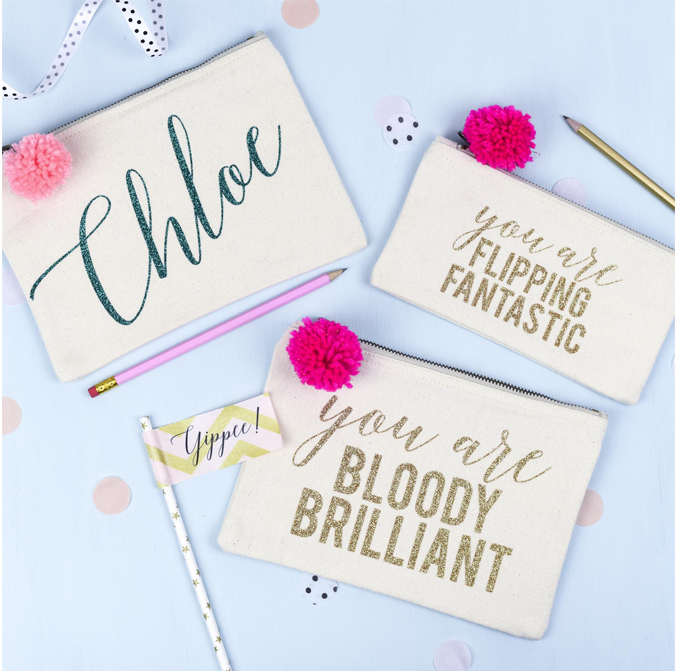 Similar to the pouches, it’s all about personalising your stationery. Remember having your name on your coloured pencils as a kid? Well, this is the grown up version! It’s also a great idea as a present for any little people in your life. We’ll also be including this as part of a gift set, which will be online in November. As my background is in fashion and textiles, I’m a huge fan of making proper pieces for the home. One day, I hope to introduce a premium interiors range to Oh Squirrel, but there’s a few other big things on the list first! These would be part of it. The idea is you can personalise the banners with a few words that mean something to you, and I’ll then handwrite those words for you, paint them in and stitch into a banner. They’re so popular for weddings, new homes and babies. They’re pretty much my favourite thing to make, as the idea of creating something with my hands that someone is going to look at every day in their home is a pretty special feeling. Oh Squirrel will be at the Christmas market! We’ve got a really busy Christmas coming up with lots of events! Having just launched a new website, we’ll be adding lots of new products to both this and the etsy shop on a regular basis over the next few months. At the Etsy Made Local Christmas Market on 2nd December we’ll be there with a big table full of wonderful gift ideas, starting from just £1.00. We’ll have plenty of cards, prints, pencils, gift sets, pouches and all sorts of fun and original gifts. If you’re ordering personalised products from us, please allow up to a week for delivery and be sure to read through the descriptions as at busy times this may vary. If in doubt, please get in touch! I spend a lot of time sharing products and behind the scene action on Instagram so you can always catch me over there, or drop us an email. Make sure you save the event in your diary.